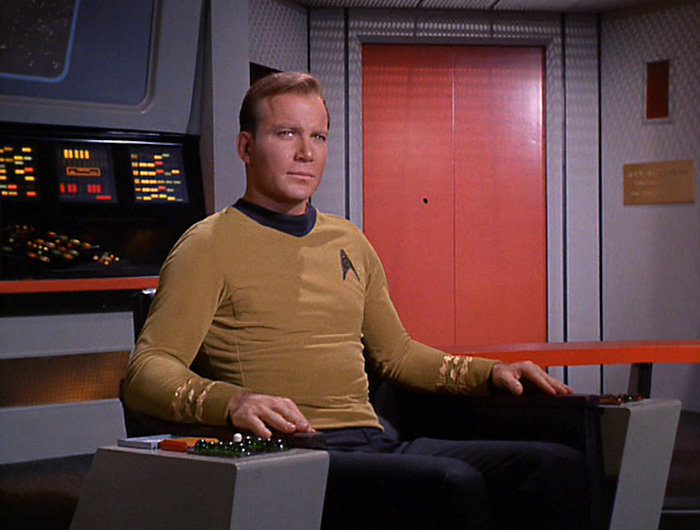 The captain's chair could rotate, allowing him to face every member of the bridge crew, and controls in the armrests gave him access to the ship's intercom. On the bridge of the USS Enterprise NCC-1701 the captain's chair was located in the recessed area at the center of the room, in a direct line with the main viewer. This position was equidistant from all the control consoles that operated specific aspects of the ship. Consequently, the captain could be immediately updated on the condition of the vessel or its crew during missions, and orders could be given clearly with a minimum of effort. The chair was mounted on a circular pillar, attached to a retangular footplate that was directly anchored to the deck, giving it considerable support during an attack. It was designed to swivel on the support so that the captain could turn to any member of the bridge crew. The chair itself took the form of a light alloy angeled support into which a low-backed, padded seating platform was positioned. A number of controls were incorporated into the left and right armrests; these allowed the captain to access several of the ship's systems. Three distinct control panels were built into the right-hand armrest, and at the bottom there was a simple push-button control that allowed the captain to access the ship's intercom. The captain often used this to address the entire crew, informing them about any dangers they were facing or telling them to prepare for specific situations. The intercom also provided the captain with a direct link to his medical officer, who was based in sickbay, and the chief engineer, who was in main engineering. In the center of the armrest there was a dedicated microtape reader that allowed the captain to access audio readouts of library or science tapes without having to leave his duty station. At the front edge of the right armrest was a smooth black plate, into which were set two sets of five raised buttons. The left-hand set were uniform white in color; they pulsed in a set pattern and could have various commands programmed into them. The right-hand set of buttons were different colors and could be used to perform preset operations such as bringing the Enterprise into orbit around a planet, maintaining the orbit, and leaving under impulse power. The armrest situated on the left had two distinct panels. Closest to the front edge of the armrest was a rectangular black section into which were set three circular buttons, three rectangular vertical buttons, and three horizontally arranged control studs of varying colors, which flashed to signify their functionality. Once again, a variety of commands could be programmed into these, in line with Starfleet's concept of flexibility in control systems, but common functions of this pnael included the launching of a shuttle from the rear of the ship and the control of the shuttlebay doors. The final control unit took the form of a narrow strip of double action toggle switches, offering the possibility of 16 different functions from eight equally sized rocker buttons. Two commands available to the captain from this console were the activation of the main viewscreen, and a general hailing signal that could be used to alert the entire ship's crew to the subsequent audio message. "U.S.S. ENTERPRISE NCC-1701" - SEPTEMBER 2000 ISSUE 17 STAR TREK: THE MAGAZINE COPYRIGHT OF PARAMOUNT PICTURES.